16 people were injured in the incident at the nation's busiest train station. A stampede broke out at rush hour among crowds of waiting passengers at New York's Penn Station after false reports of gunfire at the country's busiest train station. Amtrak police used a Taser on a man inside Pennsylvania Station late Friday afternoon, sparking chaos and mass hysteria among commuters who thought they heard a gunshot. The man and another individual were taken into custody for disobeying orders, according to the Amtrak Police Department. Authorities confirmed there was no shooting during the incident. 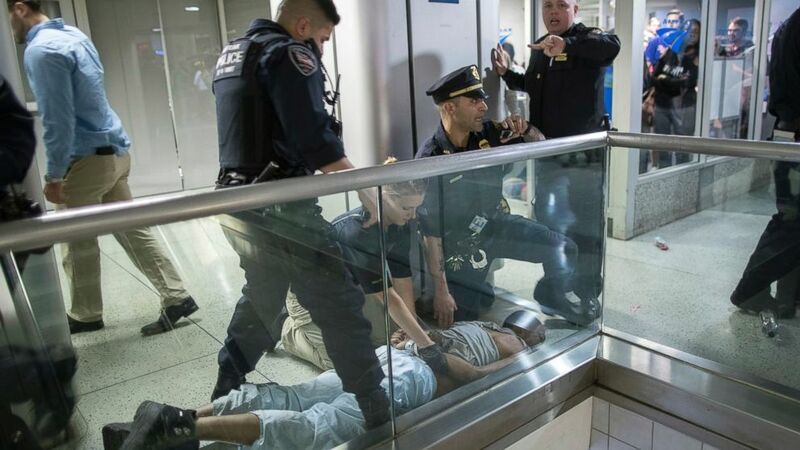 (Mary Altaffer/AP Photo) New York City police officers detain a passenger from a disabled New Jersey Transit train who became belligerent and sparked a stampede among passengers leaving the overcrowded station once the train finally arrived at New York's Penn Station, April 14, 2017. Nevertheless, it caused a frenzy at a time when the station, which serves two commuter railways in addition to Amtrak, was more crowded than usual because of long delays caused by a disabled train in one of the Hudson River tunnels. After the false rumor of an active shooter, thousands of people began running in every direction, leaving behind luggage, shoes and other personal belongings, footage shows. The New York City Police Department said 16 people were treated with non-life threatening injuries after the incident, according to ABC-owned station WABC. ABC News' Kenneth Moton and Benjamin Stein contributed to this report.